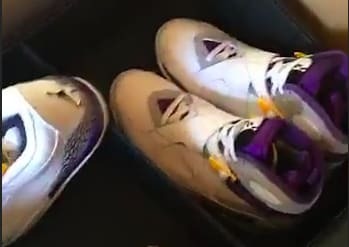 DJ Khaled is one of the biggest celebrity sneakerheads in the game, so it comes as no surprise to see that he already got his hands on the Air Jordan "Lakers" Kobe Bryant PE pack. Khaled took to his favorite medium Snapchat to show off the blessing that Jordan Brand sent him today. In addition to thanking Jordan Brand and "saluting" Bryant, Khaled also mentioned that he would rock one of the pairs on Jimmy Kimmel Live! tonight. Be sure to tune in tonight to get another glimpse at one of the most anticipated Air Jordan packs of the year.